This Black Cherry Pomegranate Cobbler will remind you of summer camp cherry pie dump cake without the canned pie filling and box mixes. It features sweet black cherries with a hint of pomegranate and a generous helping of crunchy, golden brown, buttery cobbler topping. This recipe is created in partnership with Lodge Cast Iron cookware. Last weekend Kevin dropped Kendall off for a week long overnight summer camp up in the mountains. In the weeks before she left, we were talking about what this summer camp would be like – it was her first year so there is a lot of mystery behind it. I’ve actually never attended a camp quite like the one she’s going to. Her camp is set up with lots of cabins and several bunks in each cabin and a dining hall with a camp cook. I camped a few times growing up throughout my middle school a high school summers. A couple of times we were in old cabins with mostly screen walls, and definitely no A/C (I grew up in Texas so it was both HOT and HUMID). We slept on cots with sleeping bags. Other camping trips were tent camping for a white water rafting trip, tent camping with my family, and RV camping with my Aunt and Uncle in Wisconsin. There was never a dining hall with a camp cook where I camped. Typically we cooked all our meals on camp stoves and the fire. We made things like breakfast burritos (scrambled eggs and sausage cooked in cast iron skillets on camp stoves and foil packet potatoes stuffed in tortillas with hot sauce) and foil dinners. 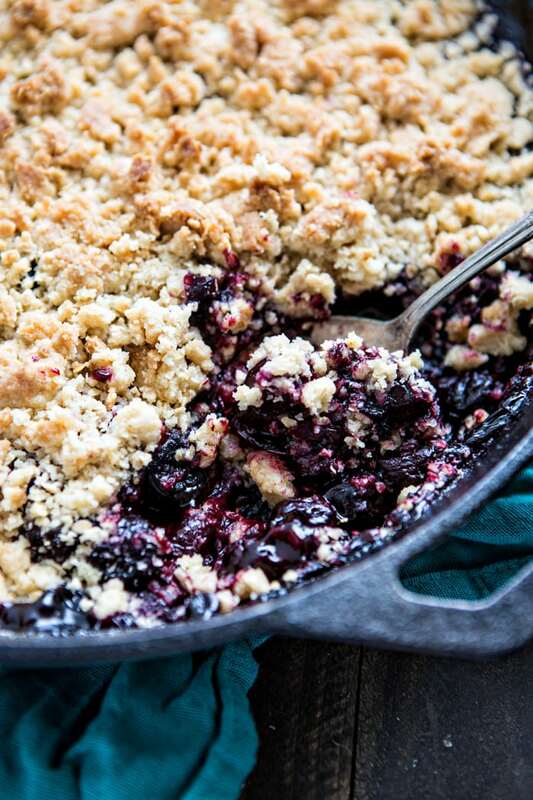 No matter what the group was or where the camp was, one thing was always the same: we made a cast iron fruit cobbler, usually cherry, and baked it in the coals from the fire. It was one of my favorite summer camp foods! Cast Iron isn’t just for camping though! I use cast iron all the time at home for every day meals and recipe and I love its versatility. I think it makes the best, crispy roasted potatoes (try Roasted Sweet Potatoes with Garlic and Sage!) 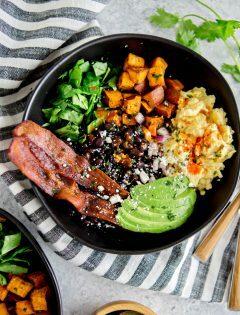 – or really any roasted vegetable (we also like Roasted Brussels Sprouts with Balsamic and Bacon) – because the cast iron pan retains heat so well and the foods cook evenly. I love how it is stove, oven, grill and fire safe. I frequently prepare foods that go from stovetop to oven, like any time I make Baked White Cheddar Mac and Cheese with Kale and Bacon, or any other Mac and Cheese recipe that has a crunchy topping. If you aren’t familiar with Cast Iron, you might want to check out some of my tips for Caring for Cast Iron Cookware. Many people have different methods, but these are some of the ways I like to care for my pans. Talking with Kendall about summer camps got me craving a cherry cobbler, so I experimented with making a homemade version of that classic summer camp cherry cobbler dessert recipe – Black Cherry Pomegranate Cobbler. Instead of using canned pie filling and a box mix for the crumble topping, I made quick homemade versions of both. Now, if you want to use fresh cherries (and spend time pitting them) by all means feel free to do that! I’ve included instructions for that in the recipe. But, I love the simplicity of using pre-pitted frozen Sweet Black Cherries. It made prepping the Black Cherry Pomegranate Pie Filling really quick and easy. I combined plenty of cherries with sugar, pomegranate juice, a little lemon for some balance to the sweetness, cornstarch, and a pinch of salt. Then, bring to a boil and simmer until thick. You can prep this ahead of time and store it in a jar in the fridge, or in a camping safe container in your cooler if you want to take this camping with you and prepare it in the fire’s coals. For the topping, I ran flour, brown and white sugar, quick cook oats, butter, and salt through the food processor to make a crumbly topping. Again, this can be prepped ahead either for time saving reasons or if you want to take it camping. Just store it in a zip top gallon sized bag and keep it cool so the butter stays firm. 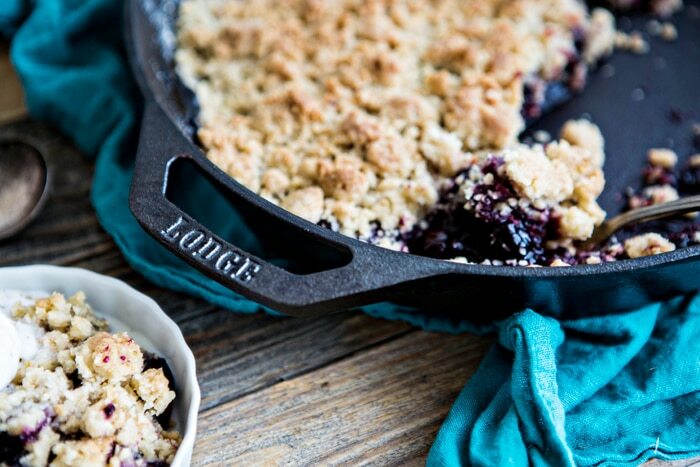 For baking, I love the new Lodge Dual Handle Pan for this recipe because it brings back the feel of summer camp by using cast iron, as well as the ease and balanced stability offered by the 2 handles. It came seasoned and ready to use with no complicated process to get started. The 12-inch size is perfect for this recipe, but it also comes in 10.25 inches. It is always great to find products that are made in the USA, too. 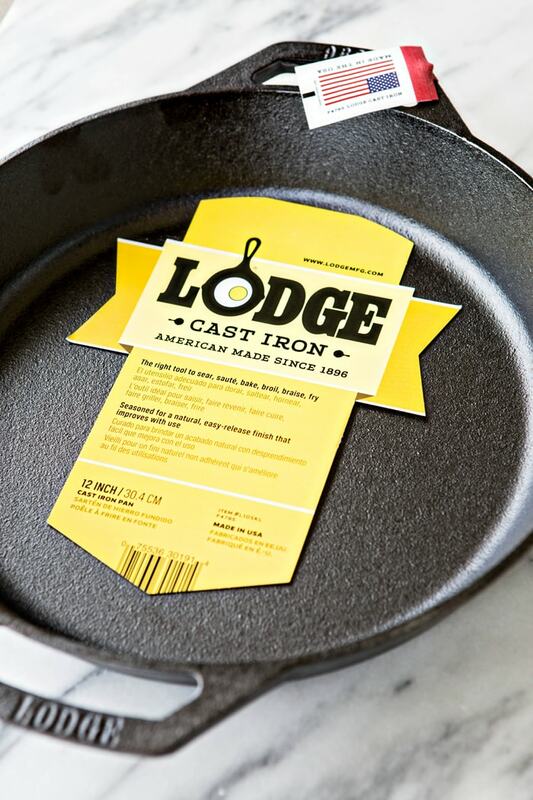 Lodge, a family owned company, has been making cast iron cookware since 1896. If you’d like to try the new Dual Handle Products, check out this Lodge Cast Iron cookware coupon code (expires July 7, 2017) – use code DUAL25 for 25% off. 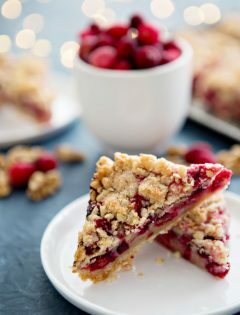 When you’re ready to bake this Black Cherry Pomegranate Cobbler, just pour the Black Cherry Pomegranate Pie Filling into the pan and top it with the crumbled bits of the topping. Bake it at 350 degrees F until the topping is golden and crunchy and the filling is bubbling. However, we really liked this version. This recipe is Kayden approved! He was the only one home when I was testing it because Kendall had just left for summer camp, my kids were with their dad on vacation, and Kevin was at work. 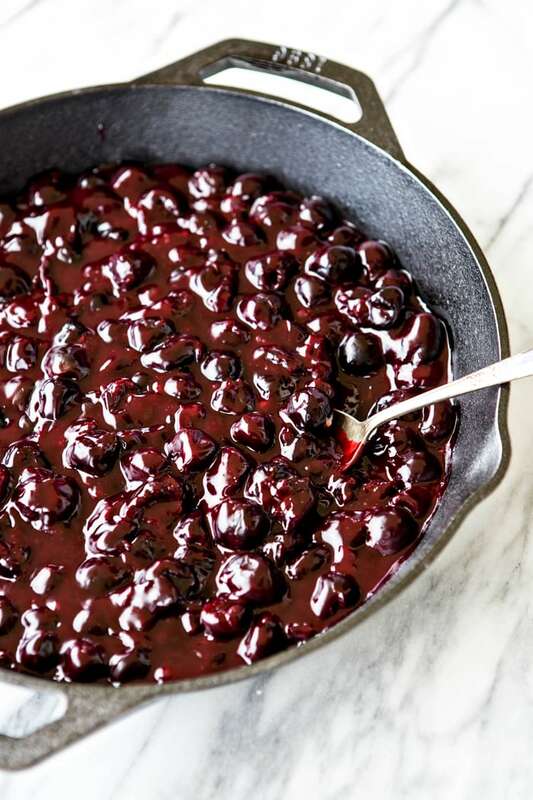 It is worth noting that this recipe features Sweet, Black or Dark Cherries. If you’re searching for a tart pie cherry cobbler, this recipe won’t bring you those flavors. Kayden said we have to make it again this summer. Then we started brainstorming all of the other cast iron pan crumble recipes we could make, because we both agreed that this topping recipe turned out so perfect! We want to try it again on a Peach Berry Cobbler and on a Cobbler with a Triple Berry mix. You definitely cannot go wrong serving Black Cherry Pomegranate Cobbler with plenty of vanilla bean ice cream or homemade whipped cream. I like the cobbler served really warm best, almost fresh from the oven, so that the ice cream starts to melt a bit. What is your favorite way to cook with cast iron? This Black Cherry Pomegranate Cobbler will remind you of summer camp cherry pie dump cake without the canned pie filling and box mixes. It features sweet black cherries with a hint of pomegranate and a generous helping of crunchy, golden brown, buttery cobbler topping. In a 2 cup glass measuring cup, combine the pomegranate juice, cornstarch, and lemon juice. Whisk until combined and smooth. In a 4 quart saucepan, combine the pomegranate juice mixture, the cherries, granulated sugar and pinch of salt. Stir, with a wooden spoon until combined. Bring to a boil over medium high heat, stirring frequently so as not to burn any of the filling on the bottom of the pan. After boiling, reduce heat to low and simmer for 2 minutes, or until thick. In the bowl of a food processor, add the all purpose flour, granulated sugar, brown sugar, and salt. Pulse 5 times to combine the mixture. Then, add the butter and quick cook oats. Process 10 - 15 pulses, or until the butter is broken up into very small bits. Pour the cherry pomegranate filling into the cast iron skillet. Reach into the food processor bowl and grab a handfull of topping. Form it into a ball in your hands and then crumble it into bits over the top of the filling. Repeat until you have used all of the topping mixture and the cherry pomegranate filling is covered. Bake in a 350 degree preheated oven for 30 - 40 minutes, or until the filling is bubbling and the topping is golden brown. Serve warm with fresh whipped cream or vanilla bean ice cream. The filling and the topping can be made ahead of time. Prepare the filling and store refrigerated in a sealed container such as a jar. 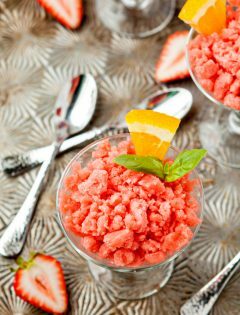 The topping is best prepared and stored in a zip top gallon bag in the refrigerator or freezer. #If using fresh, pitted cherries increase simmer time to 10 - 12 minutes. 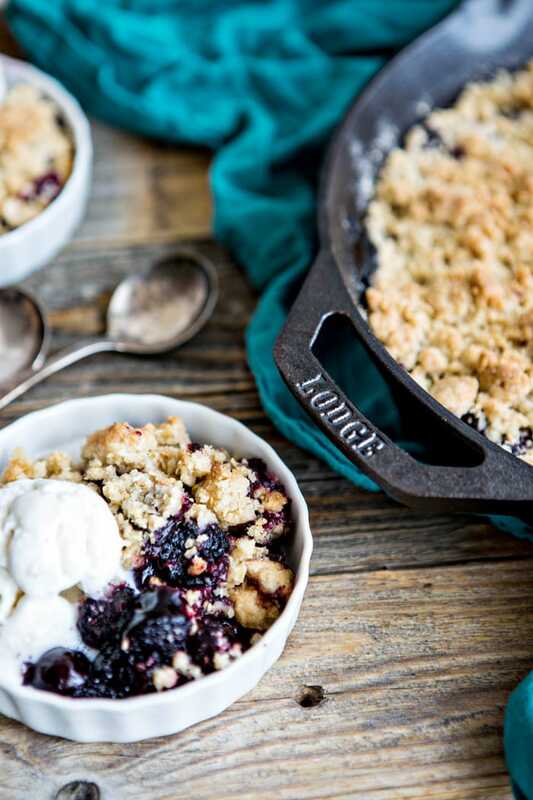 I’ve partnered with Lodge Cast Iron cookware to create this recipe for Black Cherry Pomegranate Cobbler. I have been compensated for my time, but all opinions are my own. 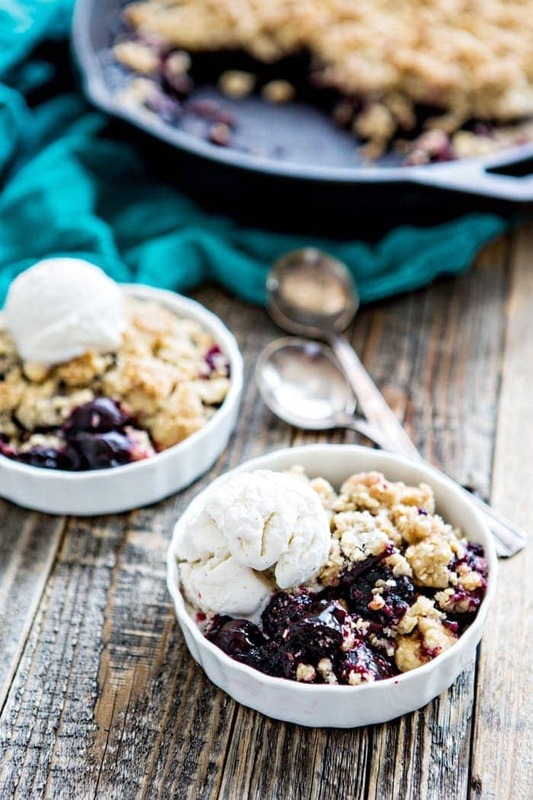 This cobbler is gorgeous! I love a good cast iron dessert! Thanks, Nicole! I love how great cast iron works for desserts. This looks so insanely good, reminds me of summer! This looks amaaaazing! I just found your strawberry galette recipe on Pinterest and am making it tonight! What a lovely combination of fruits in this cobbler. And in a Lodge skillet >>> LOVE! This looks seriously scrumptious. I love Lodge products. They stay perfect forever. Thanks, Kim. I agree! Lodge is so great!